I hate food in my Wi-Fi, don’t you? At last a restaurant that understands! There is no place for Wi-Fi in food is there? 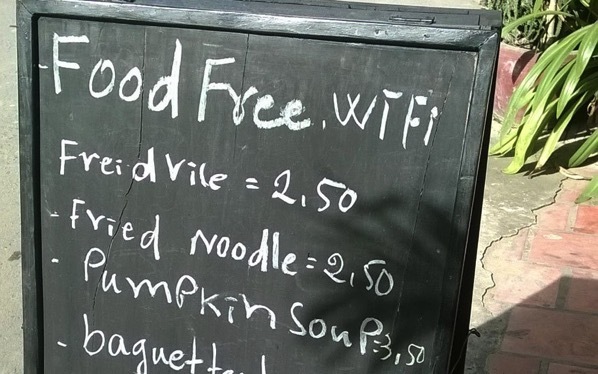 Trouble is the only place I know where you can be served Wi-Fi free food is Phnom Penh, Cambodia. Which is a little far to go if you just fancy a quick bite! But then you can get a pretty good “Freid Vile” which I believe is a local speciality, I think we in the west know it as “I wouldn’t eat that if you paid me!” usually spoke at the top of one’s voice. Which of course is a much longer title but perfectly apposite. However in various parts of the UK “Freid Vile” is eaten in vast quantities by overly inebriated locals at millions of takeaways, then later left in the back of police cars and over the floors of Accident and Emergency Hospital Departments up and down the country.